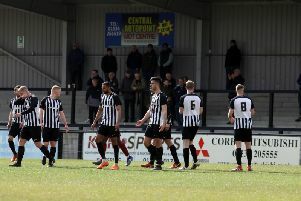 Gary Mills insists Corby Town have weeks of hard work ahead of them as they bid to shake off their “losing mentality”. Mills suffered a second successive defeat since taking the reins at Steel Park as the Steelmen were dumped out of the Buildbase FA Trophy in the first qualifying round by Evo-Stik Northern Premier League Premier Division rivals Stafford Rangers who claimed a 2-0 win. Second-half goals from Elliott Hodge and Josh Gordon proved decisive as Corby’s poor form continued. They have now suffered eight defeats in their last nine matches in all competitions. And Mills insists there is no quick fix to their issues. “The club has got used to losing games in the last 18 months,” he said. “There is a losing mentality and that’s not something you can get rid of overnight. “It will take weeks of hard work to turn it around. “It was very disappointing to lose, of course. “In the first half, I thought we did well and we played some decent stuff at times. “I felt one or two aspects that we have been working on in training came out and that was good to see. “But the problem we have is the same problem the club has had all season and that is scoring goals. We did well in patches but we aren’t putting the ball in the net.